Yesterday, the news was awash with the newly launched Hijab wearing Barbie. My soon to turn 8 daughter who is at the edge of her Barbie playing years, asked me about it. I showed a few pictures of Olympian fencer Ibtihaj Muhammad. Not only did this lady compete in the Rio Olympics, but she also won a medal. I quickly searched for a few of her videos and showed them to my little girl. 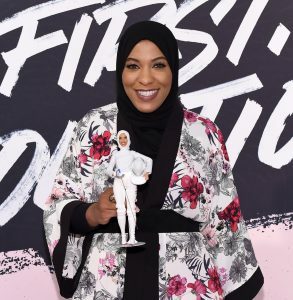 The pictures of the Olympian holding the Hijab wearing Barbie were pleasant to say the least, and her pride reflected in her wide smile was unmistakable. She has definitely put fencing on the map! She talked about how she would sew little hijabs for her dolls while she was growing up, and the visual of this master fencer yearning for a doll that looked just like her own self, was particularly endearing. Which little girl does not see herself in the dolls she plays with? But here is the part I did not like. While the concept of launching the Sheroes Collection is a fabulous one that really opens the stage for some great learning and deeper understanding of the values displayed by these heores, I was not sure about the way the Hijab was being used in the press released and news items connected with the launch of the doll. The Hijab wearing Barbie is beautiful in the likeliness she shares with the Olympian fencer. The facial features, the fencing dress and much more have been well represented. The Hijab too takes centre stage in the outfit, which is great. The hijab is a beautiful means of expression – and the world needs to understand it is the same as someone wearing a short skirt to a party to express her fashionable side. Do we talk about the short skirt? No. Do we talk about the Hijab? Unfortunately, yes. But as I watched the videos that explain the real person behind the Hijab wearing Barbie, I realised that all the news pieces and all the videos were introducing the Olympian fencer as a “Hijab wearing” Olympian. I could not help but feel as if it takes away from the lady’s core achievement. Yes, she wears a Hijab. Yes, she openly extolls the values of her very roots. But why are we focusing on that? Do we talk about other female Olympians as “Non Hijab wearing”? My daughter too, at one point, asked me – “Mama, why is it such a big deal that she is wearing a Hijab and she is a woman who won a medal?” For her the concept of a boy being able to do something and a girl not being able to the same thing, is still quite alien. To give her an answer about this new Hijab wearing Barbie, I would have to first explain to her that there are indeed obsolete values in this world where she lives – values that tilt unexplained, in favour of males. As I started this narrative, I was bombarded with more questions, her expression seriously puzzled. “No,” I had to tell her, “A football only recognizes footwork, strength and stamina – not the length of your hair, a skirt, a pair of shorts, or anything else.” I hoped this answer would suffice. But there was more to come. “But no one is talking about a boy fencer not wearing a Hijab,” she said, pointing at the image of the Hijab wearing Barbie. My point exactly, I thought. But a little more research brought me face to face with a word from a TedX talk given by the Olympian. Possibilities. While the narrative was veering into the land of India’s dowry woes and why some sections still do not want daughters, I found a way to escape into a more neutral land from where I could answer her questions without clouding her opinion about the social structure she thinks India upholds. I explained to her that there are many underserved sections around the world where women are still not educated enough. While this Olympian was born and brought up in a developed nation, her Hijab instantly puts a question mark on the faces of many people. This brought me to another term – tolerance. I explained the relevance of this term when it comes to embracing people, and shunning any acts that propagate violence and crimes against humanity. What many people do is to use the Hijab as a symbol that marks a red zone around the person wearing it. Does the hijab wearing Barbie have a gun in her hand? No! So what we have to do it to recognise that a certain section of people do not necessarily stand for the act of crime. We all have to stand, together, against these crimes. That is the beauty of the word tolerance. But at the end of the day, when I was tucking my little one into bed, contemplating whether or not I should bring her the Hijab wearing Barbie, I thought, how nice it would be if we did not have to explain all this to our children in the first place. It would be perfect. But then, the world is not really a perfect place, is it? And the Hijab wearing Barbie is doing the best she can – just as we have to teach our children to do the same! Recently I watched movies secret superstar… Again using veil /hijab for hiding identity in community which still believes that girls are only for household work…..